A Book Review for You: A Book Review for You: Toyota FJ Cruiser Hardcover by Larry Edsall 5 out of 5 stars. 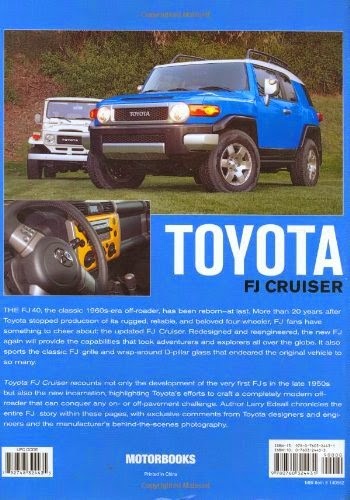 A Book Review for You: Toyota FJ Cruiser Hardcover by Larry Edsall 5 out of 5 stars. "Toyota’s legendary FJ40, the rugged off-road two-door Landcruiser introduced in 1960, sold more than one million models in its lifetime—and is still in service in the roughest parts of the world, nearly a quarter of a century after the last one rolled off the assembly line. 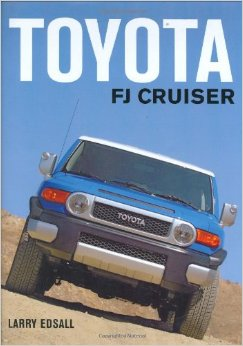 As Toyota prepares to roll out its new version of this classic, this book offers a close-up, behind-the-scenes look at the development and production of the new FJ Cruiser, a retro 4x4 that combines its famous predecessor’s unparalleled style with solid off-road capabilities and all the convenience and comfort that today's technology offers. My Review: Five Stars out of Five. This book is a treasure for the 4x4 and/or Toyota FJ enthusiast. There are lots of color photos and diagrams to peruse. This is a great book on the Cruiser. It's a bit dated from 2006, but contains a wealth of information. There are a lot of great photos and schematics of the original concept vehicle. This is a great book for the Cruiser enthusiast. I have no hesitation is recommending it to others. I blog for books; do you?